Her Universe released this fantastic Star Wars Rebel Tank last year, which was an instant buy as soon as it was released. 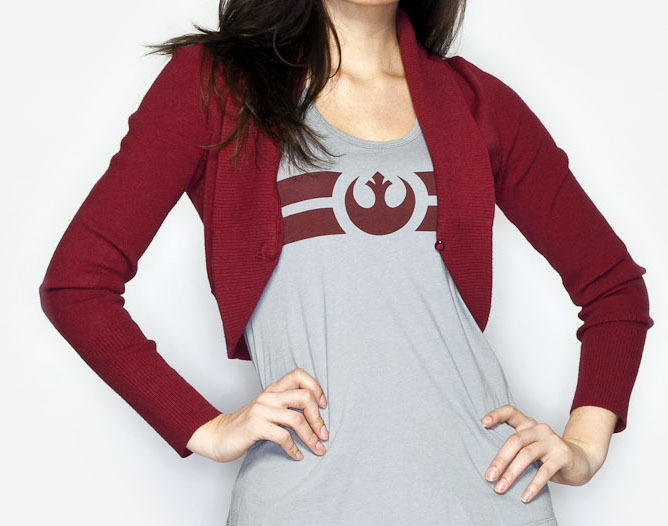 Simple, stylish, and all Star Wars – the perfect combination! The great part about this tank is how easily it can be part of a very casual, or trendy stylish outfit, depending on the rest of the ensemble. I’m a huge fan of bolero style jackets like this one, and the one used in Look #26, as they’re flattering for a range of body types. They also allow the effect of layering, which always nicely dresses up an outfit , without adding too much on, and without obscuring what you’re wearing underneath it. I picked up this bolero jacket from Ann Loft, though H&M and similar stores are great places to find jacket styles like this. It was a stroke of luck, and why it was paired with this outfit, that the color of the jacket so nicely matched the color of the Rebel logo on the tank! The Chewie and Han leggings from Black Milk are one of my favorite pieces from their entire Star Wars collection. 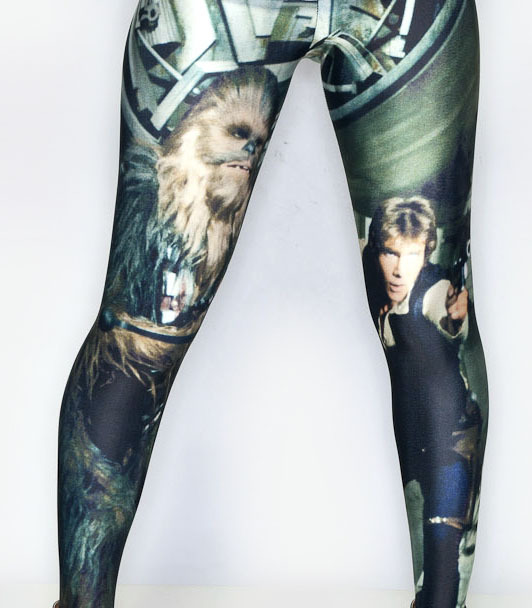 The print is perfect for leggings and is very boldly “STAR WARS GEEK” while still being totally chic. When you’re working with such a loud print, it’s best to keep the rest of the ensemble simple, which is why the Her Universe tank pairs so well with it. We’d love any feedback you have on our Looks, and if you have your own looks or styling tips you’d like to share, we’d love to see them! Feel free to contact us through our blog, or on our Facebook Page. And don’t forget, we’re also on Twitter! I love this entire outfit. I own numerous pieces from both Her Universe and Black Milk. Now I need to go but that rebel top and a jacket to match! So perfect!!! P.S. have you seen the new items HU is releasing for May the 4th? More instant buys! You know it! We’ll be posting about those later this week 🙂 Thank you!